Firepool is a chronicle of South Africa in the ‘second transition’ – one in which the foundations of the post-apartheid settlement are questioned in all kinds of ways. 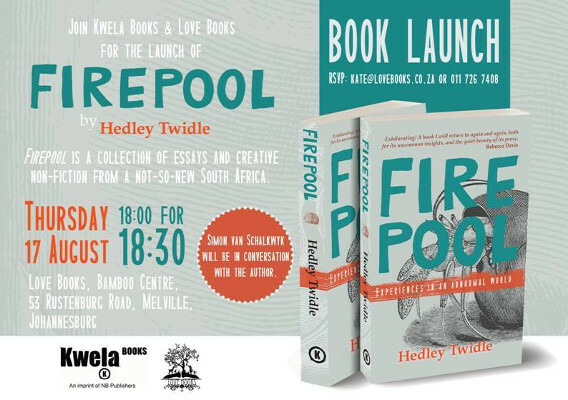 From the complex legacy of artists like JM Coetzee to the #FeesMustFall protests, and the uncertainty of our nuclear future, Hedley Twidle treats serious subjects with a sense of playfulness and imagination. Deeply personal, and spanning culture, and ideas, Twidle gets under the skin of South Africa in unexpected ways. Twidle will be chatting to Simon van Schalkwyk at Love Books in Melville on Thursday, 17 August.